PRODUCTION EXPO 2014: With a CV that includes New Order, U2, Tom Jones, The Maccabees, Crystal Castles and George Ezra, not to mention winning Mix Engineer of the Year for consecutive years in 2009 and 2010, it's hardly surprising that producer/mixer Cenzo Townshend's mixing skills are always in high demand. Operating out of the beautiful, high-spec Decoy Studios, in Suffolk, Cenzo remains one of the UK's most respected mixers. With his keen ear and passion for vintage studio gear who better to talk to about keeping things varied and what works when mixing for radio. You work with a really diverse range of artists. Is it important to you to keep things fresh? "Mixing for radio, there will be people who have a very clear idea of what they want for the song"
"Mainly I mix now so, yes, obviously I do keep an ear out on what's happening but I think it's more important that I relay what the band and the producer have given me to work with. I do quite a lot of radio mixes for Radio 1 and Radio 2 so I kind of know what they're looking for. "If they're album mixes then, when I'm given the multi-track I try and just present it in the way that I feel it's best to presented. I don't try and put tricks on everything just for the sake of keeping it fresh. "The way we work is changing so much all the time anyway that you're constantly changing your sound because of the way people expect mixes to be turned round and changes to be done." How do all the various demands of labels and artists impact on you when you deliver a mix? "The biggest impact is when you mix a song and the amount of people who come back wanting changes and the amount of revisions you have to make. There's no point trying to fight that as the simple truth is you do have to make those revisions. "If someone wants to hear something a certain way then I'd much rather print it and let them hear it rather than me saying, 'that's not going to work like that' and hopefully they'll go, 'nah, it's better as it was'." Do you ever mix with MP3 in mind? "I don't mix with MP3 in mind but I do mix with radio in mind, subconsciously, or if I'm asked specifically asked to do 'a radio mix'. In that instance there will be people who have a very clear idea of what they want for the song, whether it's changing the arrangement or just the sound being more upfront. Generally those are the two main things." "NS10s, my Pure radio and, obviously Logic and ProTools. I generally get ProTools stems, but I do like it when I get the sessions too as that gives you a better idea of what the producer or artist is trying to achieve. "When you used to get a couple of reels of tape and people had made decisions and there were balances on there, which you worked with. Now, it's not out of the ordinary to get 140 tracks of audio - one might say 'Bass Drum' another might just say 'Harmony 7', so you have no idea putting it together without the session data to help. "Even if it's Logic, although I don't work in Logic; I prefer one of the guys here at Decoy to do the bouncing so, if there's a problem we can adjust or change it then re-bounce. Generally there are a lot of things that can go wrong when you bounce out of Logic, especially if you've got UAD cards, [there can be] all sorts of delay problems." It sounds a little overwhelming, really! "[Laughs] It is overwhelming when you're given a day to do it in!" So, interpreting what people want from you as quickly as possible must be part of your skill-set? "Yeah. It's also up to them to give me as much an idea of where they were coming from. It can be challenging especially as a lot of the stuff we do is pretty commercial so it has to be done a certain way. When we're doing albums then there's much more room for artistic interpretation." What would we find you using in your mixing suite? "It starts with a 64 I/O ProTools HDX and we use Avid I/Os to Lavry I/Os and that's clocked by an Antelope. We use a Lavry Gold A-D to print the mixes back in. I work with a 56-channel SSL6000 console, which has three mix busses and I have different inserts over each mix-buss so I can send any of the mix-busses into any of the inserts if I need to. "The main outboard is a Neve 33609 Compressor, which we have three of, four Pultec EQs, two Cartec EQs, which I love - they're basically Pultec copies even down to the power-supplies. There's an LA3A compressor, two Universal Audio 1176s, a Clariphonic EQ; we use four Distressors, DBX160s, EMI compressors and an EAR 660 tube-compressor that I love even though I hated it initially. I've found this one setting for vocals where they either sound great or not. "If it doesn't sound great with that then I'll go into an 1176 or an old PYE compressor. Generally, most vocals are done between those three. I always tend to re-amp the D.I. Bass through a Hi-Watt then into an LA2A. 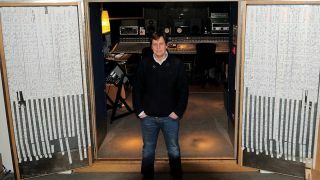 "All thee mix-busses get summed through the SSL into an Analogue Tube AT101 (http://www.analoguetube.com/), which is a handmade Fairchild copy made by a guy called Simon Saywood. There are only about eight built every year and they're fantastic." You're known for your love of old vintage outboard? "I do love it and it's really fast to use now because I have a lot of things on hardware inserts so we don't have to patch things around and the recalls are very quick because of that. It just pops up with the session. No time-consuming patching or broken patch-leads or forgetting to patch something in! "I still love old bits of outboard like the Eventide H3000, the Bricasti M7, Peavey Spring, PCM70 and a couple of Roland Dimension D, which is a brilliant old vintage chorus. They're amazing on vocals, bass or cymbals. I've still got lots of old Lovetone pedals and the like too." "Radio is like an advert in a way where you've got three minutes to advertise that artist"
Does knowing your vintage outboard so well help you get the sound you want, quickly? "Absolutely and that mixed in with plug-ins is heaven, really. With surgical EQ you can go for ten different EQs. I'm a big fan of the Waves plug-ins, I'm endorsed by them but I genuinely love them. "Another bit of hardware I love is the Audio Kitchen Little Chopper amp. They're the size of an amp-head but inside are just a valve pre-amp and a spring - they just sound amazing. There's also a company called Radial Engineering, who make fantastic 500 Series racks with little gadgets for re-amping pedals or using them as inserts. They're really affordable little tool-boxes that interface the hardware pedals to ProTools." You've recently mixed George Ezra amongst many others. How did you approach that project? "I get given the song and I generally spend a day with it, doing what I think works, trying to represent what I've been given as best as I can without straying too far from what they've presented me with. "Sometimes we'll talk about it beforehand and they'll maybe say that the chorus isn't quite lifting as much as they want or possibly there's a worry about the piano timing then we'll address those things and I'll try and get the song to work as powerfully and dynamically as possible. "I'll also keep in mind what it's for, really. Whether it's intended for radio or an album. I've just done a radio-mix for the next George Ezra single, which is a track that wasn't intended to be a single but everyone loves it so it just needed to change ever so slightly to make it more palatable for the radio play-listers." Any insights you could share on how to make something sound more radio-friendly? "Make it sound really solid. The voices obviously have to be more upfront than one would normally have it but you have to be careful not to detach it from the song. I find it has to be should be quite dry, generally. Not bone dry but you have to be careful as radio can make mixes sound mushy. "Above all, it just needs to be solid and you must be able to keep the attention span so the intro has to hit you; if it doesn't then get rid of it! You have to make sure that the transitions all work. It's like an advert in a way where you've got three minutes to advertise that artist so, basically you have to pull out all the good bits, sharpen the hooks and make it stay in people's minds."